Eyre Arms Tavern, on the corner of Grove End Road and Wellington Road, was built in 1820 and opened in 1821. It was built to high specifications and could accommodate 1,500 people. From the roof of the building, which was a favourite venue for a “pipe and pint” , there was a view to Regents Park and St Pauls. Indoor attractions included a boxing club, concerts, lectures, plays. To the rear of the Arms were “extensive grounds laid out with great taste.”. In 1827 there was a grand fireworks display, and another in 1835/6. The Eyre Arms landlord was John Hinton who died or disappeared in 1834. In the grounds there were rehearsals for the Eglinton Tournament – the 13th Earl of Eglinton was determined to revive the medieval tournament at his Ayrshire home. Sessions included the exiled Prince Louis Napoleon. The exercise was trying to knock over a dummy knight mounted on a wooden horse which trundled on rails down an inclined plane. On 28th August 1839 the spectacle was to be held in Ayrshire but it poured with rain. Landseer painted Lord Worcester, 7th Duke of Beaufort, fitted out as a medieval knight. Other events staged ranged from theatrical performances, fireworks, balloon ascents. The spacious grounds at the back of the house made it a favourite place for balloon ascents. St Johns Wood Oratorio Concerts were given in the Assembly Rooms. 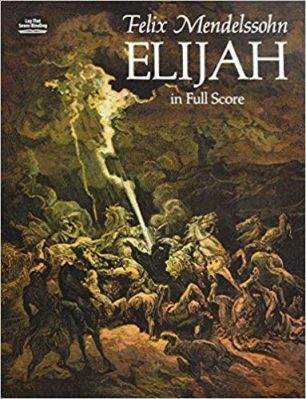 On March 3rd 1856 there was the first performance in London of Mendelssohn’s “Elijah”, conducted by Frank Mori. 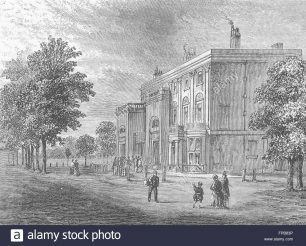 The St Johns Wood Arts Club, born in 1895, moved to spacious premises at the Eyre Arms with the attraction of a billiard room and on 27th November 1897 the first supper was held at the hotel when 32 members attended. The last manager, H.M.Willing, apparently salvaged the “series of rare lithographs and engravings of scenes and characters from Dickens after well-known artists, which hung on the walls of the saloon”. Everything else was sold, prior to the demolition of this Regency coaching inn, to make way for the block of flats now called Eyre Court.